The newest edition of our newsletter is now available. Please click above, or on the image to download the PDF. 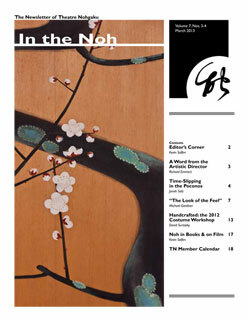 In this issue we’ve got an article covering our 2012 Costume Workshop, an article by Traditional Theatre Training founder Jonah Salz, some noh music analysis by Michael Gardiner and a new feature on “Noh in Books & on Film” by Kevin Salfen. We hope you’ll take a moment to read more about our work, our goals and noh. This entry was posted in Atsumori, Costume Workshop, Newsletter Articles, Noh Music, Performances and tagged atsmori performance, bloomsburg pa, diego pallecchia, ezra pound, fukuyama, instrumental tone-color, jonah salz, joyce s. lim, kensuku tsutsui, kevin salfen, kotsuzumi, lian hearn, michael gardener, monica bethe, noh costume workshop, noh in books & on film, noh music analysis, Noh Training Project, nohkan, oshima nohgakudo, otsuzumi, richard emmert, sasaki noh workshop, spectral analysis, taiko, takigi noh, theatre nohgaku blog, theatre nohgaku newsletter, traditional theatre training kyoto, ttt, uzawa hisa, w. b. years, women in noh. Bookmark the permalink.